Roundabout. Participatory piece made for Lupa Fete. 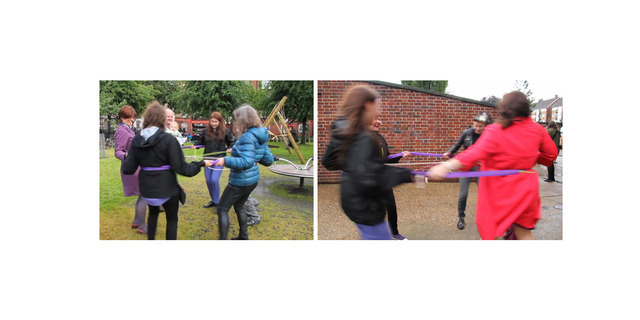 Roundabout was one of two participatory pieces made as part of LUPA Fete. In previous pieces I have made animations in which many of the objects spin and turn; this piece was made to echo such movement whilst also acknowledging the site and nature of the event. The movement and interactive nature of the piece echos previous work that invited participation; audience interactive stamp drawings that can be seen on my website. LUPA or Lock Up Performance Art hosted contemporary arts shows once a month for two years in a 'pop-up' venue a small lock-up garage the size of a single car, in Bethnal Green. For the Fete the collective took over a good deal of the Approach Estate (the garage is situated behind James Campbell House). The fete spread from the garage to the carpark, through the play area and into the allotments.